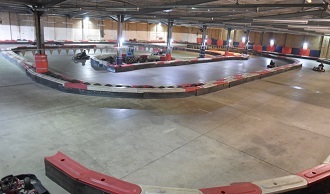 An indoor go kart circuit that comfortable fits 8 karts on and offers a great place to challenge friends & family to a head to head race using 200cc 6.5hp Honda powered Biz karts. In addition the track now boasts a fleet of Junior 120cc BIZ karts for the 8 - 12 year-olds so that budding Lewis Hamiltons can be put through their paces. A good range of race formats, even for the smaller group, as well as full-length GPs and endurance events. Handily placed in Lincoln means that it is also ideal for stag and hen parties who will still be buzzing as they head for the bright lights! Five mins qualifying to determine grid positions, 2 x 10 minute races, second race is reverse grid of the first race result. An adult only event; Practice followed by five 10-lap qualifying heats, two 12-lap semi-finals and a 15-lap final. A 90 minute team endurance event. Qualifying to determine each teams grid position followed by a 90 minute non stop race for teams of 2 to 4 drivers. Gridline racing can provide a range of options to suit all budgets and group sizes. Email us your details and we will provide a selection of options. Supply us with details of your group size and preferred dates and we will provide you with a choice of events and formats. Catering can be included for office parties, corporate events and team development activities.